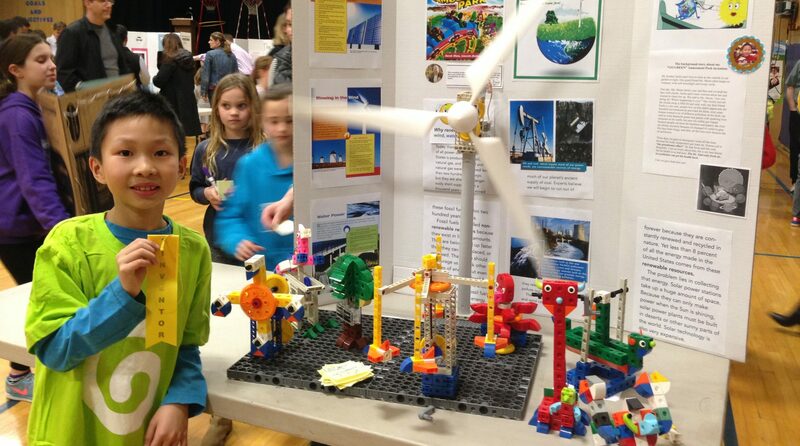 Home > Latest News > Green Energy Report: Cultivation And Creativity For Kids. Derek Shen from the U.S.A participated in “GO GREEN” Amusement Park invention.At his young age, he was not afraid of talking in front of the public, expressing the creative process with great confidence. He said,“Learning through the STEM course at school as well as making a great use of featured green energy products can create your own green wonderland.”His performance was highly appraised by the school president and the audiences were overwhelmed by his performance . He was expected to be the first guest at the Green themed Park. With the increasingly serious pollution on the Earth, the surface temperature records high. How to address the greenhouse effect becomes the issue in our daily life ; today’s diversified curriculum instruct children how to use a variety of energy and building blocks to inspire the development of the brain and logical thinking , which let the children learn to play as well as play to learn at the same time. Let’s look at how he completed the Green Themed Park project. Q1. Hi, Derek. Where did you get the inspiration of the invention for this event? I gained the knowledge of Green Energy through my STEM course. In this session, we were aware of energy exhaustion and severe pollutions! I would like to activate the project by using the green energy to get their attention. In addition, not only will they have fun, but also our offspring are able to get to know the application of the green energy. We can save the earth while having fun with blocks. Q2.Would you tell us what part of this invention you think is the most challenging? I think how I try to illustrate the idea of the invention is the hardest. Gigo blocks was easy to assemble and dismantle. Besides, I didn’t use any cardboard to clip and paste due to the stabilization of the structure. Through the experiments and adjustments, I found my creativity the best solution. And this project was going to use the solar power motor in conjunction with other various gear sets to activate all the facilities, but it turned out that the power of the motor was too weak to launch all the facilities at the same time. Hence, I added the kinetic generator set, the solar panels, and the rechargeable batteries to make it work. Q3: Derek, Is there anything new to you in this event? This contest didn’t have lots of limitations, so I could freely do what I wanted to do. My mom took me to a library to do some research about the topic. The librarian was friendly and kind to help me with my work. My mom always encouraged me with short stories to express my inventive ideas, which could make it vivid and get the kids’ attention. Through reading, I could organize and systematize the data much easier rather than test-oriented purposes. Q4. Have you got anything to share with us? I hope we all have the courage to express our ideas. I am surprised my creative ideas are supported by many children and parents. I think it is not that good to be true! My principal even awarded me the medal and said excitedly “I hope I can get the first ticket to the amusement park. I am much grateful for his encouragement; he made me feel that any innovation can succeed! This is the spirit of the scientists how they try to uphold their belief! As long as you have any idea of invention and innovation, you should find ways to make it happen! Maybe you’re the next Nobel Prize winner!